At a seminar I attended last weekend, given by the infamous Nancy Pearl, one of the rules of thumb she gave was that if a book has the character's name in the title, you better believe it's about character. Considering this book's title has most of the characters in it, I think it's safe to say that this is absolutely, positively a story in which the main hook is the characters. 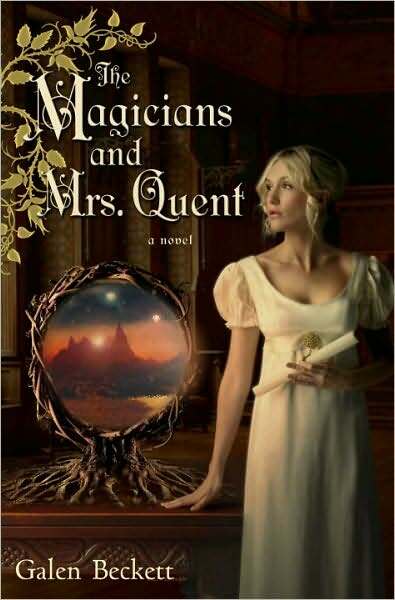 I have read this kind of story before - this homage to Jane Austen and the Brontes with magic mixed in, and it's to the author's credit that I enjoyed this novel as much as I did. I feel that so much could have gone wrong, like using characters from the aforementioned authors' works as a sort of lazy shorthand to our understanding them, but that's not what happens here. It is also written by a man, and men in general seem to have a poor understanding of Austen's works (see Pride and Prejudice and Zombies, and the numerous classic mashups, for reference). In fact most male writers don't get female characters at all, but Galen Beckett (aka Mark Anthony - no, not that one) actually does. But let me back up for a moment. The Magicians and Mrs. Quent is the first volume in a trilogy (the third is due to be published this year). And it's big. Five hundred ginormous pages with teeny-tiny type big. The story hinges on three main characters with the focus being more or less equal between them, with the exception of the middle part of the book. Primary of the three protagonists is Ivy Lockwell, the eldest daughter of a magician who has gone mad, for reasons which will be revealed as the book progresses. Ivy is a bookworm and the level-headed peacemaker who holds her family together, taking care of her father, mother and two younger sisters. The second character is Dashton Rafferdy, who as his name might suggest is a gadabout. He comes from an aristocratic family and when the story opens he spends his days in idleness and dissipation. But there's more to Rafferdy than just the rake, and of the three characters he makes the biggest personal journey, particularly where it concerns his feelings for Ivy and the growing evidence that he is a magician. The third character is Eldyn Garritt, Rafferdy's friend, who also came from a good family but whose fortunes have fallen low thanks to his abusive, drunken and now dead father. Eldyn's plot mainly involves his desperate need for money to support both himself and his beloved sister, but there is also darkness and secrecy involved where he is concerned. I ought to mention that the setting is essentially another world, albeit one that is virtually identical to late Regency/early Victorian Britain. Readers who are not into sci fi or fantasy will have no trouble keeping up with and enjoying the story. The main differences are 1) there is magic, although it is not used much in this first volume), 2) the days and nights are of varying length and there's different nearby planets and 3) the place names are different, although it is not hard for the reader to figure out that Invarel = London, Torland = Scotland, etc. The first third of the book takes place in Invarel, and it seems like we're in a Jane Austen novel with Mrs. Lockwell trying to marry off her daughters. However, there is a bleaker undercurrent with rumors of rebellion against the king in the air. The second part of the book switches to first person point of view in the form of Ivy's letters to her father. After losing all hope of marrying Rafferdy, Ivy becomes a governess in an eerie manor house on the windswept moors, and the master of the house, the elusive and mysterious Mr. Quent, bears more than a striking resemblance to Mr. Rochester. In the third and final section, the characters come together again in Invarel and after much buildup events are finally set in motion that will have significance for the country and the characters themselves. Mr. Bennick gave a sharp smile. "...to protect their secrets and to make sure they did not fall into the hands of those who might misuse them, ancient magicians often wrote in a kind of code, referring to symbols that only another who had spent long years studying the arcane would understand. Unfortunately, the meaning of many of the references Horestes and others used is lost to us now. It is one of the greatest tasks of a magician, to spend long hours poring through old books, searching for clues to the meaning of these symbols and codes." Be ye warned: although there is much to treasure about the characters, there is little to no action in this novel, not even in the climax. The middle section does start to get draggy in parts, but thankfully moves along before it becomes unbearable. The buildup is very slow, and the whole novel feels like it's just setting the scene for the next two books. The writing is very similar to Jonathan Strange & Mr. Norrell, without the tongue-in-cheek humour of the latter. It's a serious novel that doesn't take itself too seriously, and I can't get it out of my head even though I finished it days ago. I'm well and truly torn over my desire to read the whole trilogy and the knowledge that it will be a huge investment of my time when I have literally hundreds of books that need my attention. However, I have a sneaking suspicion the characters will draw me back sooner or later.